DU PONT DUCHAMBON DE VERGOR, LOUIS, officer in the colonial regular troops; b. 20 Sept. 1713 at Sérignac (dept of Charente), France, second son of Louis Du Pont Duchambon and Jeanne Mius d’Entremont de Pobomcoup; m. 8 July 1752 at Quebec Marie-Joseph, daughter of Joseph Riverin*; d. after 1775 in France. 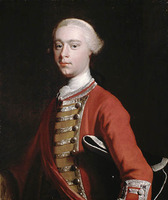 Louis Du Pont Duchambon de Vergor began his military career in 1730 as a gentleman cadet; he saw routine service at Île Royale (Cape Breton Island) and in 1737 was detached to his father’s command on Île Saint-Jean (Prince Edward Island). 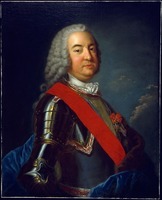 In the early 1740s he commanded at Port-Dauphin (Englishtown, N. S.), and in 1744 he participated in the Canso and Annapolis Royal raids led by his cousin, François Du Pont Duvivier. In 1745 Vergor was injured by flying masonry during the Anglo-American bombardment of Louisbourg. After its capitulation, he returned to France. 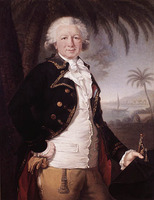 Thanks to his family connections, Vergor had been initiated into trade at Île Royale: in 1744 he had received a share of the cod that the Canso raid had yielded as booty, had invested in privateering, and had earned 1,550 livres from renting to the crown buildings at Port-Dauphin and Port-La-Joie (Fort Amherst, P. E.I.) and from transporting troops and materials in his vessels. In 1747 Vergor was posted to Canada; he was promoted lieutenant in 1749 and captain in 1750. In mid September 1750 he was dispatched aboard the brigantine Saint-François to convoy the schooner Aimable Jeanne, which was carrying munitions and supplies from Quebec to the small French post on the Saint John River (N.B.). Early on 16 October, about ten leagues west of Cape Sable (ICS. ), the French vessels were overtaken by a British sloop commanded by Captain John Rous*. Despite inferior armament, Vergor engaged the sloop, allowing the Aimable Jeanne to reach the Saint John. The action lasted the better part of the day, after which, with only seven men fit out of 50 and the Saint-François unmasted and sinking, Vergor was obliged to yield. The incident soon assumed full-fledged diplomatic proportions, because the French protested both the attack, which had occurred in peacetime, and Vergor’s treatment by Governor Edward Cornwallis in Halifax. According to Vergor, Cornwallis “lost his temper to the extent of saying that Captain Roux ought to have sunk him and had he been in the place of this captain he would have done it.” His rage notwithstanding, Cornwallis thought it prudent to release Vergor, who, soon back in France, enjoyed the distinction, for one of his rank, of personally reporting the incident to the minister of Marine, Rouillé. Though in 1750 he had been posted to Louisbourg, Vergor, earnestly supported by Intendant Bigot, sought a company in Quebec, which was granted in 1751. The following year he became a knight of the order of Saint-Louis. In August 1754 he was appointed to command at Fort Beauséjour (near Sackville, N.B. ), which with Fort Gaspereau (near Port Elgin, N.B.) had been built on the Chignecto Isthmus in the early 1750s to establish a nouvelle Acadie in the face of the British presence in Nova Scotia. According to the traitor Thomas Pichon, Vergor owed the Beauséjour posting to Bigot. The weight of testimony points to greed as the vice which dominated Vergor and which, coupled with a general moral laxity, probably made him especially attractive to the Bigot set. Courville claimed that Vergor was “avaricious in the extreme,” and it is in his memoirs that we find the famous quotation attributed to Bigot: “Profit, my dear Vergor, by your opportunity [at Beauséjour]; trim, – cut – you have the power – in order that you may soon join me in France and purchase an estate near me.” Pichon claimed that Vergor’s only interest at Beauséjour was “skimming the cream off this colony” by monopolizing control of firewood and beverage supplies, which he estimated brought Vergor 60,000 livres a year. Forts Beauséjour and Gaspereau, which the authorities in Massachusetts and Nova Scotia viewed as a threat, became the objects of an expedition in the spring of 1755. The British, under Lieutenant-Colonel Robert Monckton, landed unopposed in June under the cover of Fort Lawrence (near Amherst, N.S.) across the Missaguash River from Beauséjour. Vergor’s situation, though by no means hopeless, was disadvantageous. He had at his disposal a regular fortification, sufficient artillery, and 160 colonial regular troops, but upon his arrival he claimed Beauséjour was “in a very sad state . . . and capable because of its poor fortifications of disgracing even the bravest officer.” Louis-Thomas Jacau de Fiedmont, who commanded the artillery, agreed. As for the 1,200 to 1,500 recalcitrant Acadians in the area, severe deprivations precluded their usefulness as an effective militia force. Many invoked the oath of neutrality, which made them vulnerable to reprisals if found in arms by the British, hundreds deserted, and Vergor, in order to placate the fears of the remainder, agreed to state in writing that he had forced them to bear arms under pain of death. It was an inauspicious beginning to a frontier incident which within days would precipitate the definitive solution to the onerous problem of the neutrality of the French population of Nova Scotia. On 13 June, after seizing a ridge within range of the fort, Monckton began mortar fire with telling effect upon the French position. Though the French artillery responded in kind, inside the crowded fort demoralization rapidly gave way to quaking terror, and on 16 June, with the Acadians in service now mutinous, the helpless Vergor capitulated. The next day Benjamin Rouer* de Villeray surrendered Fort Gaspereau without being attacked. The fall of these forts marked the collapse of the nouvelle Acadie and settled the Acadian boundary dispute finally in favour of the British. 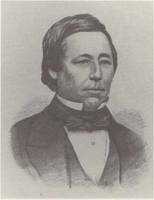 In the following weeks the Acadians of this region who did not make good their escape into the wilderness north of Chignecto were rounded up and deported to the American seaboard colonies. The minister of Marine, Machault, had good reason to believe, from private advice and published British accounts, that the Chignecto forts had been “very ill defended,” official reports from Vaudreuil [Rigaud] and Drucour [Boschenry*] notwithstanding. Machault ordered an inquiry to be conducted “without regard for anyone.” Vergor and Villeray were summoned before a court martial at Quebec in September 1757. Under the protection of Bigot and the military, both were acquitted, despite Vergor, who, according to Courville, “not having a shred of sense often made remarks that could work against him.” Certain secondary accounts and popular lore of the surrender of Beauséjour have featured with disapproval the “banquet” which Vergor had prepared for Monckton’s officers, but the gesture was consistent with the military courtesies of the day and was not invoked at Vergor’s trial as contrary to proper military conduct. Vergor continued his service, at Lake Champlain, in 1757 and 1758. In 1759 he was back at Quebec, besieged from June by James Wolfe* and Charles Saunders. Early in September he was detached to command a sentry post on the high cliff above the Anse au Foulon, at the head of a narrow trail which linked the river bank to the Plains of Abraham. It was, as Vergor’s fortune would have it, at this very point that the indecisive Wolfe finally had chosen to attempt a landing on the night of 12–13 September. A first party of redcoats landed undetected after responding to the challenges of the sentries in passable French, followed within minutes by several light infantry companies who rapidly scaled the cliff and fell upon Vergor’s detachment with complete surprise. The men, certainly not as alert as warranted by the circumstances, offered only negligible resistance before dispersing. Vergor was shot in the right leg and in the hand and was captured with several of his men. The rest fled to the safety of Quebec and gave the alarm. By this time it was daybreak, and the British, after months of siege, had dramatically established a bridgehead whence, in a matter of hours, the fortunes of New France would be sealed. It is significant that, once repatriated to France, Vergor suffered no official reprimand for his part in the British landing. Yet another of Courville’s disparaging allegations has graced most subsequent French-language accounts of the events: “This captain had with him many inhabitants of Lorette . . . ; they asked him for permission to go home to work for the night; he granted it to them; (it is claimed that this was on condition they also work for him on an estate he had in this parish . . .).” There is no evidence that supports this allegation. In 1762 Vergor was living in Paris. He later retired first to La Flèche, where his wife died in April 1770, then to the parish of Saint-Clerc-de-osnac (dept of Charente) in Saintonge, his family’s province of origin. 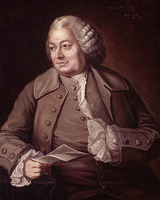 His circumstances are unclear: an entry on a 1761 official list describes him as “rich”; yet his annual journeys to the baths were subsidized, and he solicited the patronage of the bishop of Orleans. In 1763 the minister of Marine assured this prelate that “I will remember with pleasure the interest you are taking in this officer when arrangements are made for all the officers who served in Canada.” In 1768 he was awarded 2,510 livres’ indemnity for his Canadian losses. He died in poverty after 1775 “without lands or revenue.” Of his eight children, a son, Joseph Du Pont Duchambon de Vergor, returned to Lower Canada during the French terror of 1794. AD, Charente-Maritime (La Rochelle), B, 275, ff.69–92v. AN, Col., B, 94, ff.45–45v; 117, f.462; 122, f.159v; 131, f.2031/2; C11B, 23, f.64; 26, f.176v; 27, f.264; 34, ff.46–47v; C11C, 12, ff.99, 115, 146; D2C, 43, p.22; 47/4, p.345; 48/1, p.29; 48/3, p.647 (PAC transcripts); E, 143 (dossier Du Pont Duchambon de Vergor); F3, 50, f.465. Archives du ministère des Affaires étrangères (Paris), Mémoires et doc., Amérique, 9, ff.309–9v, 314–15v, 334–39, 346–47v (mfm. at PAC). PAC, MG 18, F37. PANS, RG 1, 341–41 1/2 (Thomas Pichon papers). Bégon, “Correspondance” (Bonnault), ANQ Rapport, 1934–35. “Extrait d’un journal tenue à l’armée que commandait feu M. le marquis de Montcalm, lieutenant général,” Literary and Hist. Soc. of Quebec, Hist. Docs., 7th ser. (1905), 29–78. [L.-T. Jacau de Fiedmont], The siege of Beauséjour in 1755; a journal of the attack on Beauséjour . . . , ed. J. C. Webster, trans. Alice Webster (Saint John, N.B., 1936). Knox, Hist. journal (Doughty), II. Mémoires sur le Canada, depuis 1749 jusqu’à 1760. PAC, The Northcliffe collection . . . (Ottawa, 1926), 35. PAC Report, 1904, app.G, 303, 313–21. Æ. Fauteux, Les chevaliers de Saint-Louis, 152–53. Le Jeune, Dictionnaire. H.-R. Casgrain, Guerre du Canada, 1756–1760; Montcalm et Lévis (2v., Québec, 1891; réimpr. Tours, France, 1899). A. [G.] Doughty and G. W. Parmelee, The siege of Quebec and the battle of the Plains of Abraham (6v., Quebec, 1901). Frégault, François Bigot; La guerre de la Conquête. Francis Parkman, Montcalm and Wolfe (2v., Boston, 1884; repr. New York, 1962). Édouard Richard, Acadie: reconstitution d’un chapitre perdu de l’histoire d’Amérique, Henri D’Arles [M.-J.-H.-A. Beaudé], édit. (3v., Québec et Boston, Mass., 1916–21). P.-G. Roy, Bigot et sa bande, 239. Stacey, Quebec, 1759. J. C. Webster, The forts of Chignecto: a study of the eighteenth century conflict between France and Great Britain in Acadia ([Shediac, N.B. ], 1930); Thomas Pichon, “the spy of Beausejour,” an account of his career in Europe and America . . . ([Sackville, N.B. ], 1937). Ægidius Fauteux, “Les Du Pont de l’Acadie,” BRH, XLVI (1940), 260–62. Bernard Pothier, “DU PONT DUCHAMBON DE VERGOR, LOUIS,” in Dictionary of Canadian Biography, vol. 4, University of Toronto/Université Laval, 2003–, accessed April 24, 2019, http://www.biographi.ca/en/bio/du_pont_duchambon_de_vergor_louis_4E.html.